Plastic canvas wall/door decoration #4554. Hobby Kraft kit. Plastic Canvas, Acrylic Yarn, Needle, Easy to follow instruction. Kit includes. #61129 Bucilla. 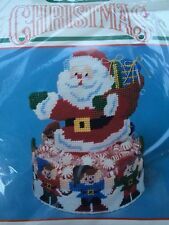 Santa Nuts and Candy Baskets Plastic Canvas Kit. tapestry needle. 100% acrylic yarn. Complete kit contains. Darice Plastic Canvas Shapes. "Round with Raised Center". Plastic Canvas. Acrylic Yarn. Kit includes. Trending at C $6.73eBay determines this price through a machine-learned model of the product's sale prices within the last 90 days. Needle Craft Ala Mode Plastic Canvas. 100% 4 ply Acrylic Yarn. I will respond back quickly. I describe item conditions to the best of my ability and will always point out any flaws or defects that I am aware of. 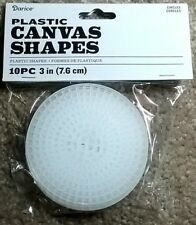 "Plastic Canvas Shape, 12""-Circle Clear". Product images are for illustrative purposes only and may differ from the actual product. Due to differences in monitors, colors of products may also appear different to those shown on the site. 12 ROUND -PLASTIC CANVS 12 RD. DARICE-Plastic Canvas Shapes. Use these little shapes to create fun and colorful projects! Design: Clear Circles. 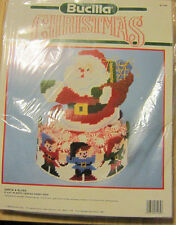 1991 Bucilla Santa & Elves 8" X 10" Plastic Canvas Candy Dish Kit. Kit 61139 Christmas. VTG Bucilla Plastic Canvas Santa & Elves Candy Dish. Model Number: DAR33305. Manufacturer Part Number DAR33305. Product Model DAR33305. Manufacturer: DARICE. Manufacturer DARICE. Model Number: DAR33005. Manufacturer Part Number DAR33005. Product Model DAR33005. Manufacturer: DARICE. Manufacturer DARICE. Item#: 5087790. Model Number: DAR33004. Manufacturer Part Number DAR33004. Product Model DAR33004. Manufacturer: DARICE. Manufacturer DARICE. Item#: 5087789. 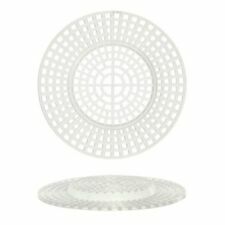 Darice Plastic Canvas Shape - Circle.